Increased risk of infection is a tradeoff of social living. While the possibility of contracting a parasite is greater when living in a group, the negative effects of infection may be decreased. Living among others may create a tolerance to the parasite’s effects. However, these potential benefits have rarely been described. To address this, CEID member, Vanessa Ezenwa, and a colleague conducted a study on wild Grant’s gazelles and their common parasites, gastrointestinal nematodes (GIN). Typically, an increase in GIN correlates to a decrease in consumption of food by a host (i.e. anorexia); however, large groups tend to have a greater consumption of food. This suggests that while social animals may have a higher risk for GIN infection, their social nature counteracts some of the negative impacts of GIN infection. The researchers conducted an experiment on 9 gazelles treated with an anthelmintic (an anti-parasite medicine) and 10 untreated gazelles. 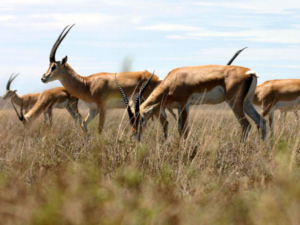 Upon identifying the experimental and control groups, researchers released the gazelle and collected data on feeding frequency, group size, and level of parasite infection in both groups. They found that social living increased the chance of GIN infection by studying the individuals whose anthelmintic treatment wore off after approximately 120 days. Treated individuals had high levels of feeding regardless of group size. The control group (those who did not receive treatment) only reached comparable levels of feeding to the treated when in a large group. The reason as to why the gazelles in larger groups do not display GIN related effects as much may be due to their ability to spend more time feeding and not as much time surveying their surroundings. It may also be due to the multitude of social interactions occurring, impacting immune and endocrine responses which also influences appetite. While this study brings to light the benefits of social living among the highly parasitized, more research is needed to focus on the specifics as to why there is parasitic tolerance among large groups.